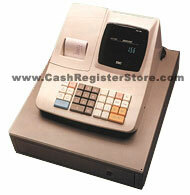 Portable TEC MA-156 Electronic Cash Registers at Cash Register Store. The portable TEC MA-156 electronic cash register may come in a small package, but you will find it to be a full featured product that carries the "punch" to satisfy your business needs. It provides high levels of cashier convenience, increased speed, improved accruacy, added productivity and extended reliability. Modern styling and a compact, low-profile design make the TEC MA-156 portable cash register ideal for a wide variety of small retail applications. As an added plus, the TEC MA-156 portable cash register can be configured with an optional battery pack that will allow you to conduct your business in areas that are without electricity. Serial drum, 2.2 lines per sec.